I love searching through Pinterest for nail art designs and ideas but when I try to recreate them myself it never seems to work out too well. In the past I’ve tried using nail art stamps, pens, and dotting tools and sadly the best I can achieve on my own is polka dots. 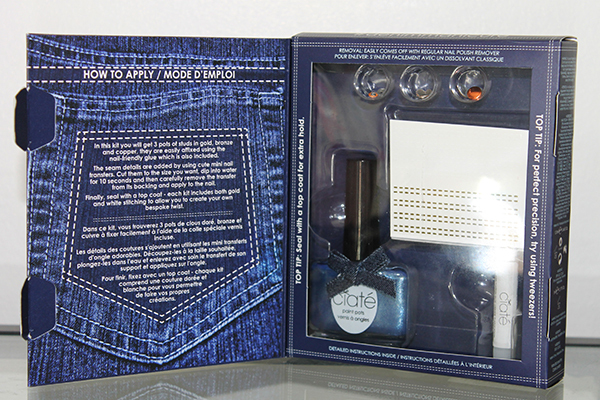 Ciate have recently came out with a DIY nail art kit to achieve a Denim Manicure*. 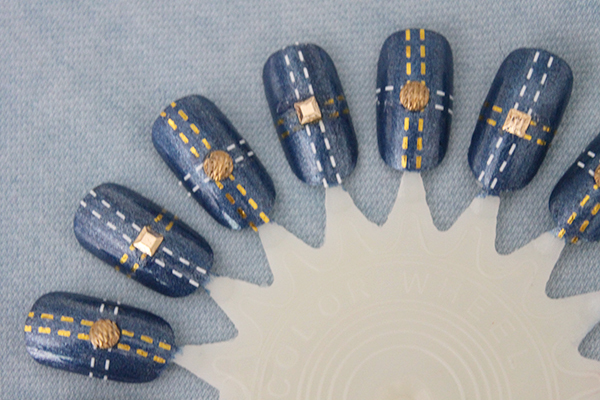 The kit is exclusive to Selfridges to celebrate the launch of their Denim studio and it’s the perfect way to achieve an interesting nail art design without any difficulty. Here’s how it works. When you open up the kit you’ll find the Ciate Nail Polish in Regatta which is a gorgeous metallic blue shade with some silver shimmer running through it. The polish alone is quite large so when you’re all out of the nail art decals you can continue to use the polish. 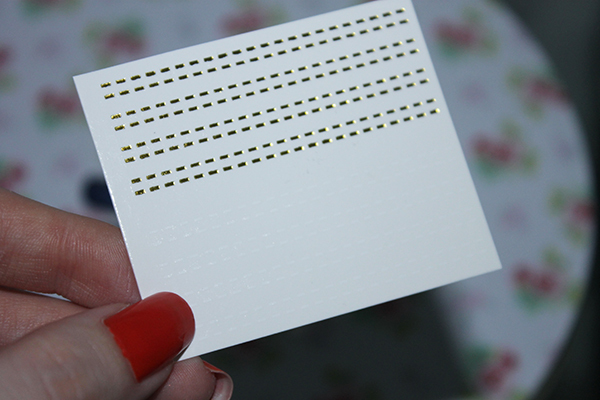 Also included is three pots of metal studs in gold, bronze and copper with the nail friendly glue to attach them on. 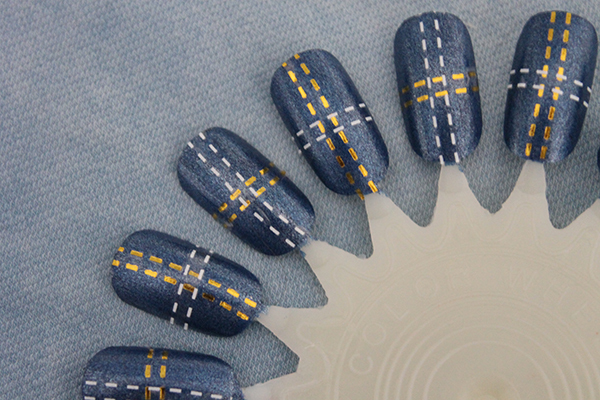 Also in the kit are these nail transfers which mimic the idea of the seams on your jeans. When I first saw the kit I thought I’d have to draw on the seam details but these decals make the process much easier. First what you do is cut which seam colour you want to use, I find it best to cut the entire length of the strip and cut them to size when applied on the nail. Simply place the nail transfer into water for 10 seconds, remove the nail transfer from the backing and apply straight onto your nail. I decided to position the nail transfers in quite a uniform way, but changing the colours of the strips to alternate to make it more interesting. The process of applying the transfers was really easy. Since the nail transfers don’t set as soon as you apply them, if you don’t have them in quite the right position you can easily peel them off and start again. Out of all the steps, this part was a little more tricky so I’d suggest you arm yourself with a pair of tweezers. I decided to apply the metal studs in the middle of the nail, some with square and some with rounded bronze studs for something a little bit different. The application of the glue wasn’t too difficult but because the metal studs are so small it takes some time to position them in the exact position you want. Once I was happy with the design and the glue had set, I applied a clear topcoat to keep everything in place and I was done! I really enjoyed trying out the set. I still have quite a few more metal studs and a whole other set of nail transfers so for the next time I’ll definitely try something a bit more adventurous. If denim isn’t really your thing, Ciate have a ton of other nail art kits to choose from, the Kaleidoscope Klash set looks amazing! As I said before, the kit is exclusive to Selfridges at £12, considering a Ciate nail polish is £9 alone, it’s a bargain!